Now you can manually control your AMP Research PowerStep with a temporary over-ride switch. Whether deploying them to wash or retracting them for off-roading; the switch gives you the flexibility you want in a PowerStep. Allows the PowerStep; PowerStep XL and PowerStep Xtreme to be manually raised or lowered. The Switch can easily be installed on the dash; and can be wired directly to the PowerStep Controller. Keep the steps up and out of the way; regardless of what you do with the doors. Steps are activated by the doors; deploying when the doors are opened; retracting when they are closed. Keeps the steps down and ready for use; regardless of what you do with the doors. Innovation in Motion is the battle cry of AMP Research. The company is an American design and technology company founded in 1980 and is renowned for their innovative truck and Jeep accessories. AMP Research is the maker of the Powerstep step boards. The Powerstep system is designed to automatically lower when the doors are opened. The step boards will retract cleanly when the doors are closed. This system will give your truck a cleaner and more aerodynamic appearance while improving ground clearance when off-roading. The Powerstep system is one of the most innovative and useful mods for any type of Ford, Chevy, GMC, Jeep, RAM, and Toyota truck or SUV. AMP Research also makes the Bedstep for the truck bed. The Bedstep is a small and rugged retractable bumper step that makes it easier to step-up or step-down the bed of your rig. The Bedstep system flips down easily with a nudge of a foot. Push it up and it retracts cleanly under the bed. The Bedstep is strong enough to support up to 300 lbs. and is backed by a 3-year/36,000-mile warranty. 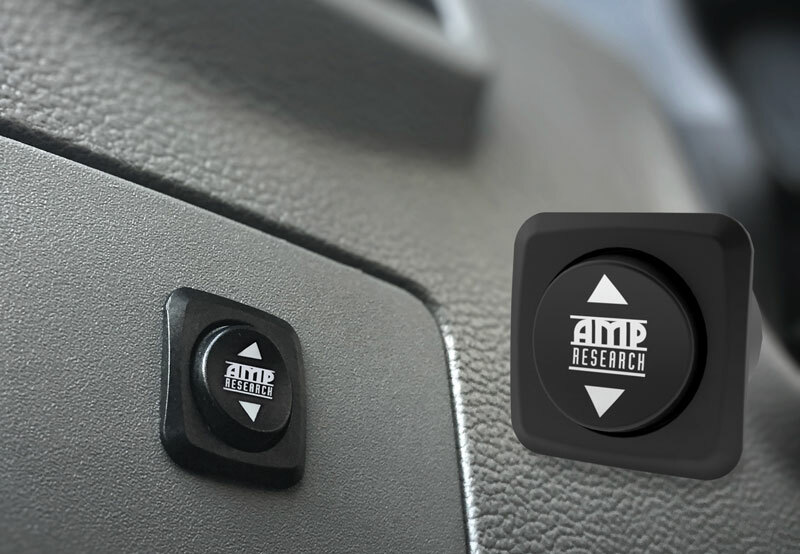 But for truck owners who are looking to maximize the cargo capacity of their rigs, AMP Research has the perfect solution: The BedXtender HD MAX. This kit lightweight and is made from 6063 T6 aluminum alloy tubes. The system has the classic U-shape flip-out design. Open the tailgate and flip it out to add 2-feet of enclosed cargo area in the bed. Close the tailgate and flip it inside to safely hold cargo and tolls in the bed of your rig. Sam’s Motorsports is a premium seller of AMP Research truck accessories and offers the Bed Xtender HD Max, BedStep Bumper Step, and PowerStep XL Running Boards at low and affordable prices. 2002-2018 Cadillac Escalade AMP Research PowerStep Override Switch Kit, The AMP Research PowerStep Override Switch Kit is designed specifically to fit your 2002-2018 Cadillac Escalade without any modification to your beloved Cadillac Escalade. AMP Research PowerStep Override Switch Kit will also fit 2003-2018 Cadillac Escalade ESV, 2002-2006 Cadillac Escalade EXT, 2002-2006 Chevrolet Avalanche, 2015-2018 Chevrolet Colorado, 1999-2019 Chevrolet Silverado, 2001-2018 Chevrolet Suburban, 2001-2018 Chevrolet Tahoe, 2014-2017 Dodge Durango, 2002-2019 Dodge Ram, 2001-2018 Ford F-150, 2004-2004 Ford F-150 Heritage, 1999-2018 Ford F-250 Super Duty, 1999-2018 Ford F-350 Super Duty, 1999-2018 Ford F-450 Super Duty, 2015-2017 Ford Transit, 2015-2018 GMC Canyon, 1999-2019 GMC Sierra, 2001-2018 GMC Yukon, 2001-2018 GMC Yukon XL, 2003-2009 Hummer H2, 2006-2010 Hummer H3, 2009-2010 Hummer H3T, 2004-2010 Infiniti QX56, 2014-2017 Jeep Grand Cherokee, 2007-2018 Jeep Wrangler, 2006-2008 Lincoln Mark LT, 2010-2018 Mercedes-Benz Sprinter, 2004-2015 Nissan Armada, 2004-2018 Nissan Titan, 2016-2018 Nissan Titan XD, 2010-2017 Toyota 4Runner, 2008-2017 Toyota Sequoia, 2005-2018 Toyota Tacoma, 2007-2018 Toyota Tundra. If this AMP Research PowerStep Override Switch Kit is not exactly what you are looking for to accessories your , please don't give up just yet. Our catalog has huge variety of parts and accessories for your .